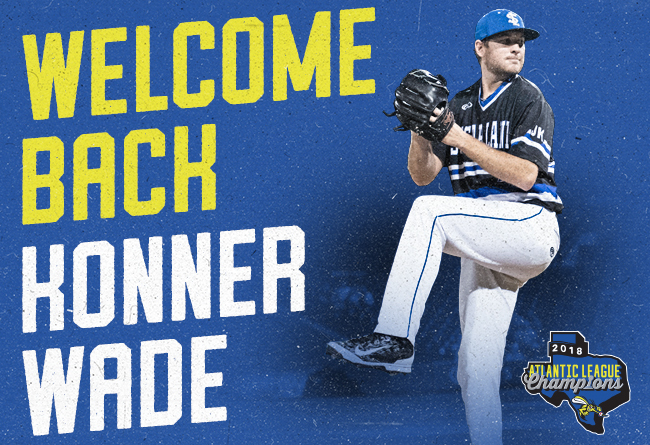 SUGAR LAND, TX — The Sugar Land Skeeters today announced that they’ve re-signed right-hander Konner Wade. Wade, 27, first joined the Skeeters in 2018, going 8-6 with a 3.10 ERA in 27 games, logging a team-high 136 ⅔ innings pitched. Wade, who was selected to the 2018 Atlantic League All-Star Game, was third in the Atlantic League in innings pitched, fourth in ERA and tied for 10th in wins. Out of Atlantic League pitchers with at least 100 innings pitched in 2018, Wade’s 19 walks allowed were the second fewest. Wade threw a shutout in Game 2 of the Atlantic League Championship Series on Sept. 26 against the Long Island Ducks, striking out 11 without allowing a walk. It was the highest single-game strikeout total and the first-ever shutout in Skeeters postseason history. Wade spent the 2018-19 offseason with the Venados de Mazatlán of the Mexican Pacific Winter League and logged a 2.14 ERA and 1.262 WHIP in eight starts while going 5-1. The Colorado Rockies selected Wade in the seventh round of the 2013 MLB Draft out of the University of Arizona. The Arizona Diamondbacks also selected him in the 35th round of the 2010 MLB Draft out of Chaparral High School (Scottsdale, Ariz.). Wade has spent all five of his seasons at the affiliated level in the Rockies farm system, reaching as high as Double-A. He’s gone 29-35 with a 4.05 ERA in 137 games (89 starts) at the affiliated level, averaging just 2.1 walks-per-nine-innings. While at Arizona, Wade was selected as a Louisville Slugger Preseason All-American in 2013 and was selected to the College World Series All-Tournament Team in 2012. The Skeeters, winners of the 2018 Atlantic League Championship, open the 2019 season on April 25 at Constellation Field against the Southern Maryland Blue Crabs. Season tickets and mini plans for the 2019 season are currently available and individual tickets will soon be made available. To purchase season tickets or mini plans, or for more information on ticketing, please visit sugarlandskeeters.com or call the TDECU Ticket Office at 281-240-4487.